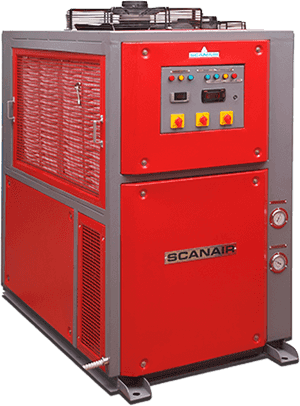 Scanair is one of the prominent manufacturer and suppliers, exporters of commercial heat pump water heater systems. These units find their application in commercial hot water industries and are highly appreciated for their superior functionality and cost effectiveness. Heat pumps are used for hot water up to 75 Degree C. Hot water and oil is utilized in the industries like chemical industry, mould heating, milk processing plants and food processing industry. Oil and hot water are the sources of indirect heating energy, which are centralized in one place and are circulated to entire plant for various uses. Our Heat Pumps are capable of saving heavy cost in maintenance and prevent the problem of installing refrigeration system for each machine of the plant. Manufactured as per the diverse Indian and international standards these units are high in demand. Only world class imported scroll technology compressors and components are used for manufacturing these units, which ensures reliable operation, energy efficient system and environmental protection. Our heat ex-changer for Freon to water heating is manufactured with multiple injection flow technology with Freon circuit, dynamically balanced blower fan and evaporator. The condensers are specially designed to assure better efficiency and energy saving, the act as an important factor in industry for any equipment. The design of our heat pumps has been made in a way to hold water of about 200 to 20000 litres tank. from 1Kw to 50Kw in put power with circulation pumps From10LPM to 50LPM with different heating and cooling capacity. This unit is capable rugged nonstop working for commercial applications, where there would be requirement of large volume of water and it does effectively meet the needs at a very low cost. Operating these units is very easy and does not require much skilled manpower. The time options and temperatures could be preset on intelligent digital temperature controller. Our heat pump based products have high energy efficiency, the coefficient of performance could be more than 4. It has a compact size, unlike the boilers that could occupy a good room space and can be installed with much ease and at any convenient location. It is possible to get continuous hot water supply without any trouble and it will works in all types of weather and seasons without any difficult and even at night, cold days and rainy days! It could be scaled for meeting the different requirements ranging from large commercial installations to hotels. The heat pump operating cost is much lower than that of the operation cost of boilers, just as 40% of oil buran boiler, 50% of coal burning boiler, 30% of electric boiler which is makes it much feasible in the long run. Air to Air and Air to Water heat pumps are frequently used in Commercial building water heating, Hotels, Restaurants, theatres, shopping malls and boutiques Hospitals, Diaries, Canteens, institutions, Hostels, Household water heating, , Industrial application pre-heating for seed drying, laundry applications, drying application needs, Swimming pool heating etc, they are often installed in ceiling voids or alcoves and offer substantially favorable cost comparisons against conventional boiler systems when measured against installation and running costs. Heat pumps are used in many industries, to recover heat or as an integral part of the process. Swimming pools can use heat pumps as the primary source of heat for the water in the pool, showers or to augment an existing fossil fuel system. In enclosed swimming pools, dehumidifying is necessary and the heat recovered from the vapour in the air by a dehumidifier is easily returned to heat incoming fresh air or through a heat ex-changer. 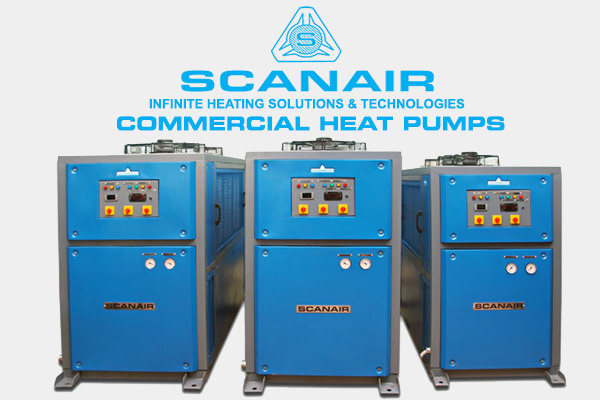 Scanair Heat pump water heaters are effective solutions for water heating and cooling applications for all types of buildings, domestic, commercial and retail premises including hotels and residential complex. 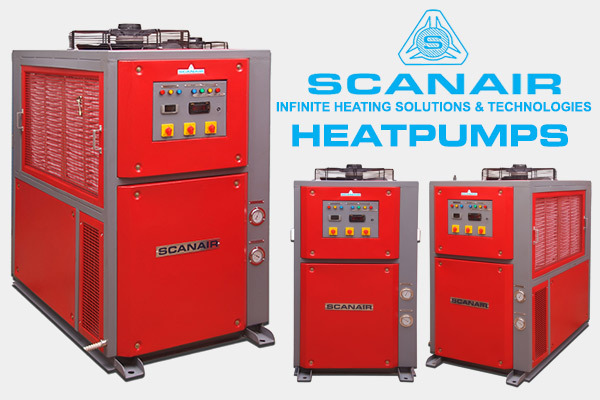 Scanair water heat pumps will supply temperature range from 5˚C To + 65˚ C ± 1˚ C, capacity from 1Kw to 150Kw From 50 LPH to 15000 LPH with different heating capacity this well-proven technology has been in use for decades and Heat Pumps are at work all over the country providing safe, reliable heating and cooling at affordable prices. Where Heat Pumps are used for water heating they are capable of highly cost effect energy applications because they tap into a limitless supply of clean, pollution-free heat either the surrounding air or heat captured in the ground all you pay for is the energy to transport that heat, and in some applications, most of this energy can be reclaimed. 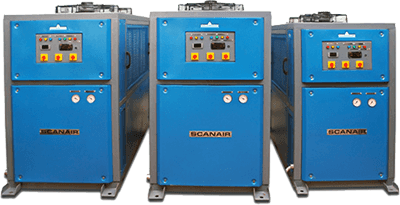 Scanair Heat Pump water heaters are used for heating, they are capable of highly cost-effective energy applications because they supply of clean, pollution-free heat and greenhouse gases add increasingly to the effects of climate change. As a low carbon technology, heat pumps can significantly reduce electrical consumption. Heat pump technology can be used in applications like space heating or cooling for human comfort in offices, homes and all kinds of residential installations. They can also be found in commercial applications where large quantities of air are available for drying, swimming pools and factory food production. Heat pump water heaters are not only advantageous for domestic application but also proven to be extremely helpful in other industrial uses. What makes such technology appealing and worth the investment is the fact that it can be used on both extreme environmental temperatures whether it is winter months or summer days. You will be saving a lot on installation as well the purchase of equipment. You simply have to buy one unit to address two different conditions. Moreover, one will also save on the space you need as you will not to allocate a wider area for the installation of two units but will have to allot a smaller space to cater to a unit that will be able to perform two separate cooling &heating modes. Each unit is designed to gather heat sources water from the underground or surrounded atmosphere air sources. Such water is expected to be relatively colder than the surface water even if it is not yet winter but more so when wintertime sets in. Using this innovation, one will not have to worry on how to ensure continuous supply of free flowing water during colder months. As the equipment allows collection of even the coldest water from beneath the surface it however will not deliver the same quality of water but rather it is much warmer. Such shows how much convenience one can get from using this equipment. No more worries on solid or ice water stacked on your pipes. Scanair heat pump water heaters are equipped with digital temperature controller to see the temperature and it can be adjustable in order that you will be able to use water with a desired temperature. You can have it hot if you are bathing in a cold spring or just a little warmer for the elderly as well as younger house members. For those who simply cannot avoid the fantastic feeling of wading in a pool, worries on swimming on ice waters can now be eliminated. You just have to turn on this unit to the desired temperature and your enjoy swimming will not be curtailed during the colder seasons.